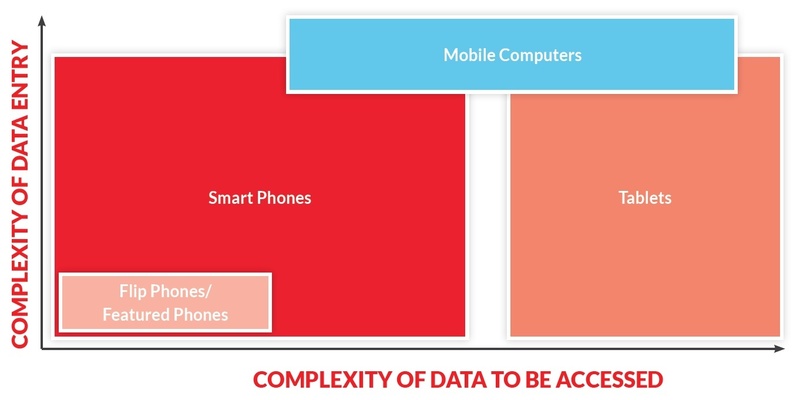 There is almost a correlation between the complexity of the data and the size of the device. If data needs to be entered in a more manual way, the bigger the device will need to be. And, in the same way, the more complex the data that needs to be entered or accessed is, the bigger the device will need to be (see graphic above). Collection of GPS data is achieved automatically by almost any type of mobile device, without any data entry required. Nevertheless, if GPS data needs to be accessed, a bigger screen like that of a tablet to display map features is an advantage compared to a regular smartphone. For basic voice communication via PTT over LTE, smaller devices such as simple feature phones, smartphones, or even iPods could be sufficient as the only requirement is a button on a screen needing to be pressed as well as audio needing to be recorded or played. Most mobile devices are built with cameras that can be used for capturing simple data, like taking pictures or even scanning bar codes. For more manual data entry or capturing signatures, a bigger screen or even a keyboard may be required which is available on mobile computers. The access of highly complex data like CAD drawings or blueprints requires not only sufficient processor capacity, found on larger devices, but also a more suitable interface like a keyboard or mouse to navigate. For a long time, feature and flip phones have been the most sold form factor by carrier reps thanks to incentives and low price points. They have a certain level of ruggedness, a radio-like look and simple functionality that make it easy for a less technology savvy workforce to use the device purely for PTT communication without specific training. However, these phones have declined by 7.9% over 2016, while smartphone sales grew 2.5%. The primary reason for this is that they use proprietary OS firmware, their capacity and software is significantly inferior to those of smartphones and data entry and access is also very limited. Smartphones are the ideal tool for most applications including PTT over LTE solutions. Using a standard operating system (OS) like Android or iOS, they allow a wide range of integrations to all kinds of applications that allow automatized as well as manual data entry supported by standard features such as touchscreen displays, sensors, GPS, NFC, high resolution cameras, and microphones. Tablets are like smartphones with a larger screen size (>7 inches/18 cm) which is a trade-off at the expense of wearability and compactness. Apart from the bigger battery which has only slight improvements on total usage time; as the screen requires more power, there are no real improvements on CPU or memory compared to a smartphone. The main advantage is that the larger screen allows better accessibility of data and is especially useful for GPS and map usage. That’s why we see tablets being used within in-vehicle applications such as trucks, busses, and taxis. It is very important to note that tablets are still considered mobile phones and their use behind a steering wheel is against distracted driving regulations unless an accessory is used with them, such as a speaker mic which allows one button touch communication functionality. Portable Media Players run standard operating systems and can therefore load any type of applications; even PTT applications. They are significantly cheaper than smartphones and do not require a subscription which does limit their use to a defined perimeter which can be covered by a solid WiFi network. There are other downsides to these devices as they are not designed for use cases other than media applications. Another problem is that most of these players go into sleep mode if not used for a certain period of time. Mobile computers are significantly more expensive than mobile phones and offer a more tailored feature set from a hardware and software perspective for specific use cases. The most recognized examples of mobile computers are bar code scanners as well as label printers used in warehouse management, logistics, and retail applications. Tailored for PTT over LTE usage, there is a specific category of phones called PTT phones. What makes them different from regular consumer phones is that they are equipped with a dedicated PTT button on the side of the device to facilitate PTT communication. PTT applications would map the PTT function to the side button to allow PTT communication without having to unlock the screen or phone, something that is usually only bypassed by PTT accessories. These PTT phones are often more ruggedized than consumer phones as they are intended to be used in outdoor work environments.